Nobody works with kids for the money or fame. Each of us began teaching kids how to CrossFit with the hopes of improving the general health and fitness of as many of them as possible. We want to have full classes, and we want the kids to have a ton of fun in the process. Our programming is designed to teach proper movement skills and improve the general fitness level of all kids, but no two kids are alike. Each comes to his or her first class with different skills and abilities. Some are natural athletes, and others need help to understand some of the basic movements. Josh MacDonald explains how he managed a host of kids for a no-parents evening at the box. Saratoga High School replaced standard P.E. 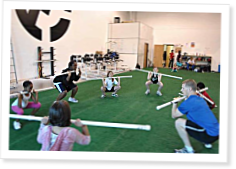 with CrossFit, and while all kids might not like putting in the effort, most report that they’re seeing great results. Thank you, Josh, for your committment to the disabled community. In working with our adult Downs Syndrome son, we confront his own unreasonable expectations about what exercise will do for him. We redirect his attention to form and tell him the "six pack abs" he wants may come later. Also, we find that the Syndrome does not allow for muscle tone to develop even after regular exercise. Again, thanks Josh for bringing the needs of this community into the duscussion. Great article Josh. Thank you for your patience and dedication as a CF Kids trainer! As the father of a 3 year old autistic boy, trying to get my two older children into Crossfit Kids, thank you for this encouragement. It's great to see what kids CAN do, instead of being always told what they can't. Keep up the good work, Josh. Good advice. Sounds like a great person. Keep up the great work @ Fury! Thanks for this article. I have a child with these tendencies, but the parents don't really think so...been struggling with what to do. As I read your article I thought you were an OT even before I got to your Bio at the end. Being out of the profession for a few years you were making me want to go back and dig out my old college text books. I always thought Crossfit and OT were related we both use functional activities to achieve positive outcomes and meet goals. Great article. Thank you for posting this article. I'm a mother of a 13 year old high functioning autistic gal. CF has been a life changer for me....all positive. Nice to know that approaches for teaching children who have challenges are being practiced so that I can share with her the positive effects CF has provided to me.